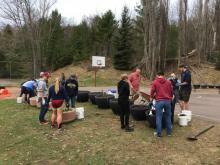 Original visitors to the Keweenaw found a peninsula, connected to the Upper Peninsula mainland, at both east and west ends, with a series of connected lakes (Portage Lake and Torch Lake), with a waterway and swampy areas interconnecting them, and small creeks connected to Lake Superior. [These were dredged out in the 1870's to form what is now the Keweenaw Waterway]. Thus it was in the early 1800's, but with the discovery of copper in the mid 1840's by Douglass Houghton, everything changed. Mining came, along with people, from everywhere. As mining enterprises sprung up on both sides of the waterway, along with the towns of Hancock and Houghton, traveling across the dividing waterway became a necessity throughout the year. In the next decade, barges and small boats ferried people, horses, and goods across the waterway, also bringing commerce via the waterway to other communities such as Dollar Bay, Lake Linden & Hubbell, White City, Jacobsville, and many other settlements, and in winter, via roadways marked across the ice, often a hazardous passage. In 1853, one Sam Eales, seeing a need, obtained a ferry boat, the Lizzie Sutton, (later adding the Liviathen (1858), and (1865) the Northern Light ferries). Fees at the time were 10 cents for pedestrians (each way), 40 cents for each horse, and 60 cents for a horse & buggy, but ice crossings were still required in winter. 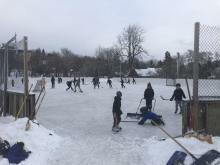 But by the 1870s, it had become apparent that something year round was now needed. On February 16, 1871, the Houghton County Board of Supervisors granted rights to three men - Messrs. Streeter, Gottstein, and Ames, to form a new company and build a private wooden toll bridge across the waterway. 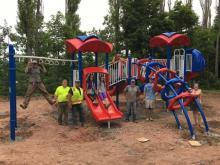 This project failed, due to piling problems on the north side, but the need was recognized. 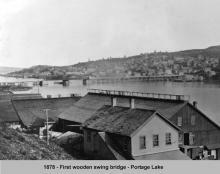 It would be January, 1875, when the Board of Supervisors granted private investors George Shelden, and James Edwards, authority to construct a (primarily) wooden, two lane toll bridge, with a swing center section to pass maritime traffic, and with their investment of $10,000, a new company was formed. By September 30, 1875, the turntable for the swing section arrived on the Cuyahoga, and by January, 1876, the bridge was in use. Bridge tolls: 1 cent each for pedestrians (one way), 10 cents for single horse draws (over and back), and 15 cents for double horse wagons (over and back). (The ferries went out of business by late 1876, after the bridge was opened). 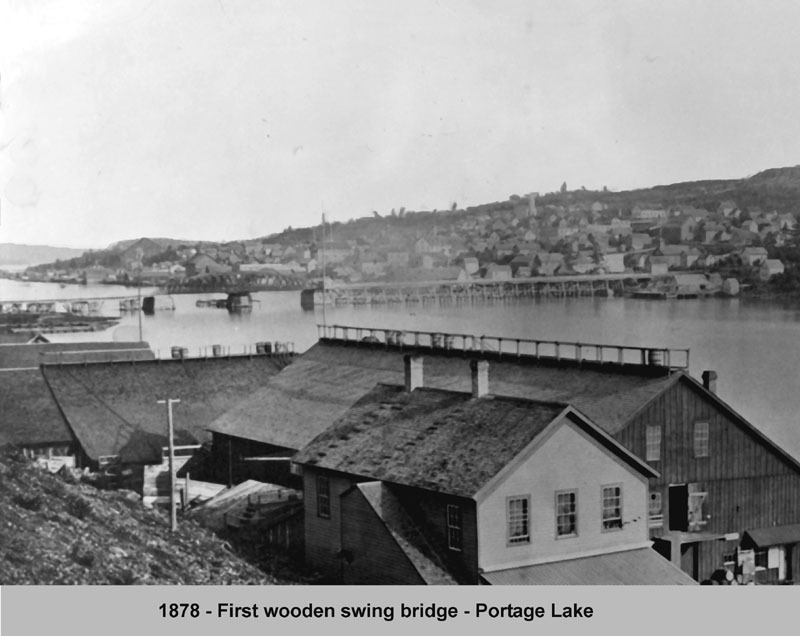 But rapidly increasing commerce in the area, along with high maintenance costs, as well as a new need to accommodate railroad traffic, caused the owners to sell the bridge to Houghton County in 1891. 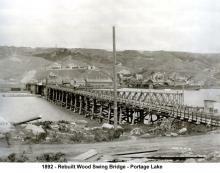 Tolls were immediately abolished, the plank roadway was raised and rebuilt, and a railroad level was added underneath (1892). 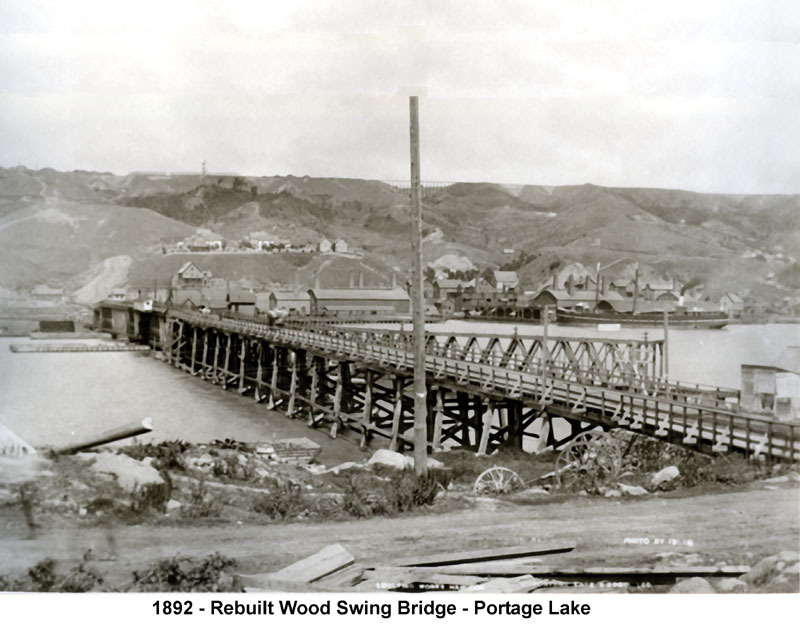 In 1897, the Mineral Range Railroad Company built a new iron swing type bridge, replacing the old wooden bridge. This bridge also featured a two lane roadway, with a railroad crossing underneath. New reconstructed support cribs were also sunk. But on August 15, 1905, disaster struck, when the steamer Northern Wave (Mutual Transit Lines), en route to the Quincy Smelter to pick up copper ingots, smashed into the center section, destroying much of it. The mishap was apparently caused by a mixup in signals. The bridge would be replaced one year later, again with an iron bridge, and center swing section, and a control house above the roadway, over the center turnstile. This new bridge would have 118 ft. of clearance on the north maritime passage, and 108 ft. on the south side passage. (Newspaper accounts of the period, gave maritime traffic at 6,000 bridge openings per year, and up to 40 daily train crossings per day, both of which began to taper off by 1920). Although almost struck again in 1940 by the Steamer Maritana (Hutchenson Lines), it narrowly avoided the collision by dropping its anchors which caught the submarine telephone cables, stopping it just short of the bridge. (This would happen again 20 years later). Light signaling was added during WWII, to augment the steam whistles already in use. The bridge served the communities until 1960. 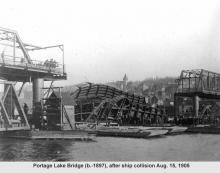 In the late 1950s, the Michigan Department of Transportation began studies on how best to replace the aging bridge, with a more modern one, that would accommodate the now much larger ships plying the waterway. It was decided to build what would be become the worlds heaviest aerial lift bridge, which was under construction by 1959, just to the West of the then current bridge. This new bridge, with 4 traffic lanes above, and a railroad crossing below, had it’s ribbon cutting on Saturday, June 25, 1960. But it almost didn’t happen. 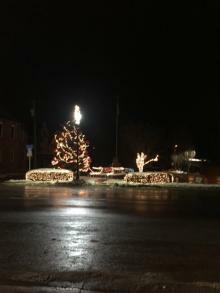 During the night before, the Steamer J.F. Schoelkoff (American Steamship Company), traveling westward, signaled for the bridge to open, but the signals were not acted on. Dropping all their anchors, they snagged the submarine telephone cables in an eerie repeat of 20 years previously. Onlookers for the ribbon cutting ceremonies were treated to the spectacle of a large freighter jammed crossways in the waterway, just a quarter mile from the Bridge. Area phone service was disrupted for nearly three days. Telephone service to the bridge, and marine radios were installed shortly. 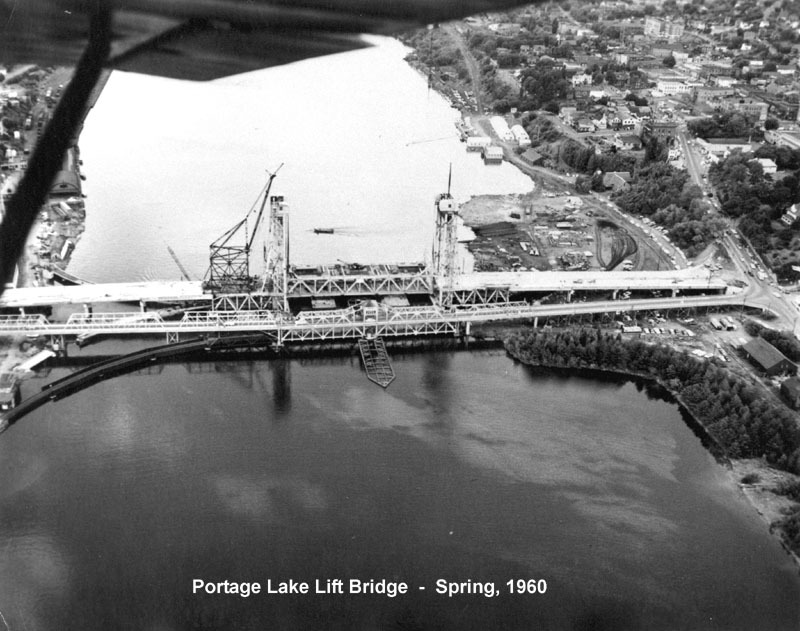 That incident not withstanding, the new Portage Lake Lift Bridge continues to well serve the area, as the possibility of adding yet another new bridge may be explored. 1878 - Taken from the north side of Ruppe Dock and Warehouse in Hancock. 1892 - Taken from just west of Houghton end. Note new railroad line feeding into bridge from the east bank (right side of photo), and white control shack on left (west) side of swing section. 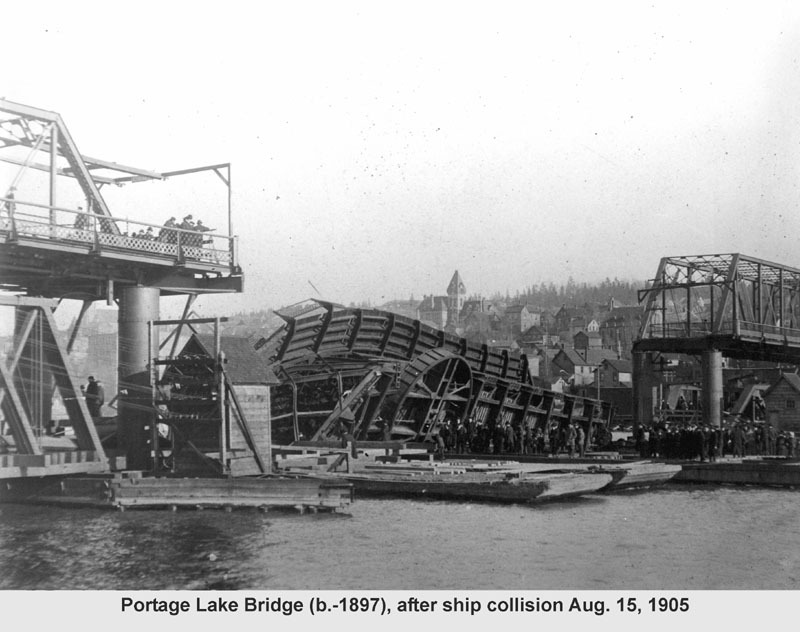 1905 - Demolished swing section wreckage is loaded onto two barges for removal. Shack on left was power feed (via submarine cables) to controls and motors on swing turnstile. 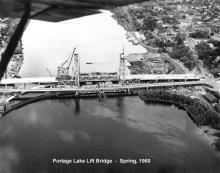 1960 (Aerial) - This aerial photo, taken from east of bridges (looking west), shows the rebuilt 1906 bridge. Note control house built above roadway on center of swing section. Bridge construction area (Hancock side) is on right side of photo immediately above new bridge, and just above that (cluster of buildings on shore) was the Naval Reserve Training Center. 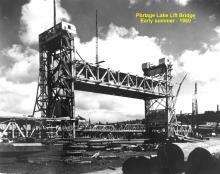 1960 (Lift) - Old bridge can clearly be seen in the photo taken from just west (looking east) on the Hancock side construction materials area. Text and digital imaging by Roland Bruce Burgan, 2005. Original photos: City of Hancock Archives.